Erosion of silastic bands following vertical banded gastroplasty is a well-known but rare complication. Silastic bands have also been placed above the gastrojejunal anastomosis of banded Roux-en-Y gastric bypasses to limit gastric pouch dilatation and subsequent weight gain. Traditional approaches for managing this complication include expectant management, open removal, or laparoscopic removal. We describe an endoscopic approach in managing silastic band erosion in patients following banded Roux-en-Y gastric bypass. Five patients presented with abdominal discomfort two to eight years after banded Roux-en-Y gastric bypass. 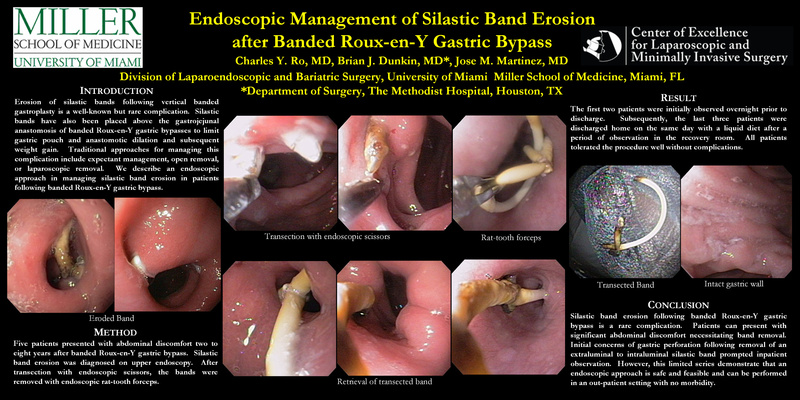 Silastic band erosion was diagnosed on upper endoscopy. After transection with endoscopic scissors, the bands were removed with endoscopic rat-tooth forceps. Patients were initially observed for at least 24 hours prior to discharge. Subsequently, patients were discharged on a liquid diet after a period of observation in the recovery room. All patients tolerated the procedure well without complications. Silastic band erosion following banded Roux-en-Y gastric bypass is a rare complication. Patients can present with significant abdominal discomfort necessitating band removal. Initial concerns of gastric perforation following removal of an extraluminal to intraluminal silastic band prompted inpatient observation. However, this limited series demonstrate that an endoscopic approach is safe and feasible and can be performed in an out-patient setting with no morbidity.